Olivier Giroud did not score a goal against Cardiff at the weekend. He did not score a goal for France at the World Cup either. But just as his performances in Russia helped his country to glory, Giroud's impact on Eden Hazard could be the key to Chelsea's success this season. He provided Hazard with two assists on Saturday. The first was a delightful flick into his path. The second was arguably even more impressive with Giroud holding off his marker and somehow diverting the ball to his team-mate. Naturally, the little genius did the rest. Hazard is in devastating form. His hat-trick against Cardiff means he has scored five goals in three Premier League starts, a tally he did not reach until December last season. Something has changed. "He is being used really well by the manager," says Jamie Carragher. There was the usual speculation about Hazard's future in the summer but there was also much excitement about him working with Maurizio Sarri. The Italian favours a more expansive game than his predecessors Jose Mourinho and Antonio Conte. As a result, the hope was that Hazard would be given more freedom - perhaps even emulating his compatriot Dries Mertens, who was converted from talented winger to prolific goalscorer for Sarri's Napoli at a relatively late stage in his career. The early signs are even more promising than many could have hoped. While the opposition has been modest so far, Hazard's numbers are up this season. He is having more touches both inside and outside the box. He is having more shots and scoring more goals too. The player himself is relishing it. "We have great players and we want the ball," he said recently. "I'm that kind of player who likes the ball at my feet, so I can be happy." Interestingly, Hazard's creativity has not increased so much. He now seems as likely to get on the end of things himself as to be the one setting up chances for others. It hints at a change of role. It is a change best facilitated by the presence of Giroud, not Alvaro Morata. Hazard said as much at the weekend. "He is a target man," he told Sky Sports. "Maybe the best in the world? I think so. When he gets the ball, he can hold the ball and we can go with him in deep. It is a pleasure to play with him. "Alvaro is a different type of player." The statistics for this season highlight the contrast. Handily, Hazard has spent almost the exact same amount of time on the pitch alongside each of Chelsea's two strikers this season - 153 minutes with Giroud and 154 minutes with Morata. That is where the similarity ends. Morata has passed the ball to Hazard six times this season. Giroud found him nine times against Cardiff alone. While the Frenchman helped to lay on two assists for Hazard in that game, his Spanish counterpart has yet to even create a chance for his team-mate. So Hazard wants to play with Giroud? "I think he is saying that," says Carragher. "You don't normally hear something like that. No disrespect to Morata but I think he is saying to the manager that he wants to play with this guy more often than not. As for Giroud, Carragher adds: "I have always felt that he was one of the most underrated players in the Premier League, even when he was at Arsenal. He is not world class even though he has now won the World Cup, he is just short of that. 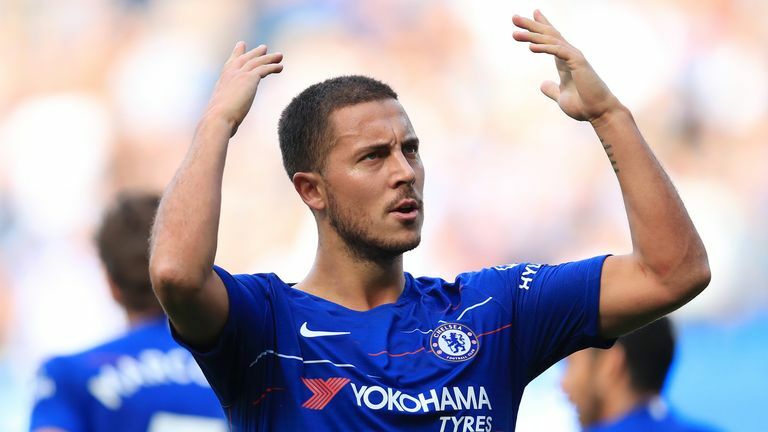 But whether it's as a second striker or as a first striker as he may now be at Chelsea, he's a fantastic player and Hazard speaking like that about him shows what he thinks too." In one sense, the comparison is unfair on Morata because few forwards can compete with Giroud when it comes to this aspect of the game. He has created more chances per 90 minutes than any other genuine striker in the Premier League over the past two seasons. It is no coincidence that he also averages more touches in the box per 90 minutes than any other Premier League player in that time period. As Hazard pointed out, when Giroud gets the ball, his team-mates "can go with him" in the knowledge that he will hold it up. The average position data for the game against Cardiff underlines this point. It shows that Hazard's touches came in advance of Giroud. In contrast, in Morata's most recent start at Newcastle, Hazard was much deeper than the striker. It is a very different relationship. The bald statistics show that five games into the Premier League season, Morata has scored and Giroud has not. But it is not quite that simple.